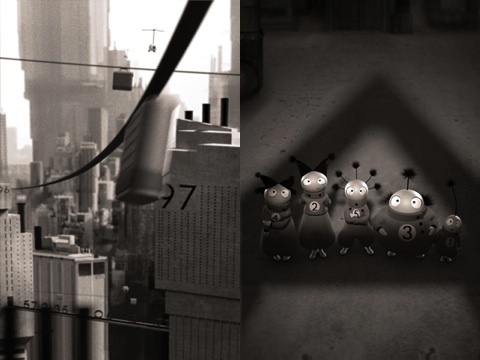 The Numberlys iPhone, iPod Touch, and iPad app begins with a beautifully produced black and white movie with a vintage touch. The marvelously crafted soundtrack brings life and energy. In the Numberlys world everything revolved around numbers. There were no names–just numbers. Everyone moved orderly in traffic and lined up perfectly to wait for food in the cafeteria. 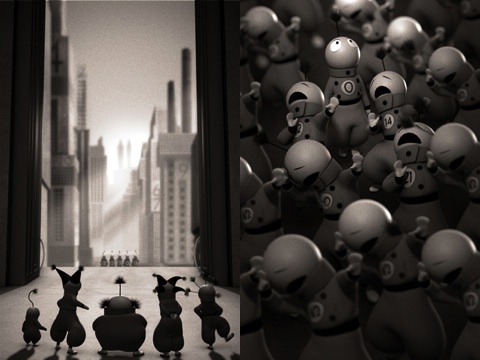 As the story says, “Everything added up, so life was sort of. . .numberly.” The black and white film has a bit of noir vibe, but it is not dark in a dangerous sense that would be frightening to young children. The alphabet construction gradually brings the color and light to the Numberlys iOS app world. When the Numberlys characters craft letters, you and your children help make the letters using agile gesture controls. You bounce parts of numbers off trampolines to form letters, or you use cogs and physics controlled gestures to create letters. There is a concise pop-up to explain the functionality required. For each letter, there is smart, witty commentary filled with alliteration to further engage and drive home the sound of the letter created. One of the cute phrases is, “Next, knees must be bent, and knickerbockers knocked!” You can press the cog in the top right corner of the screen, and you can spin the wheel to access a different letter or part of the story. This is an excellent navigation tool, as teachers and parents would certainly be able to use the Numberlys iOS app to reinforce spelling and literacy for a longer period of time. Repetition is an important aspect of childhood development, and this functionality lends itself to revisiting letters and moving forward in small increments. It could also be a great disciplinary tool, as the child with the best behavior could have the privilege of using the gesture controls to create the letter. As a parent of elementary age children, I see the Numberlys iOS app as a desperately needed 21st century tool that speaks to how children learn now. They are uninspired by worksheets and memorization, but perk up immediately when exposed to learning experiences with iOS apps, social media, and online resources. The Numberlys iPhone, iPod Touch, and iPad app inspires, engages, and gives you chills with its wit, charm, and educational message. AppSafari review of Numberlys was written by Jenni Ward on June 20th, 2012 and categorized under App Store, Education, Featured, Fun. Page viewed 4209 times, 1 so far today. Need help on using these apps? Please read the Help Page.